In short, The Raven is one of the funniest movies that I’ve ever seen, in any genre. It has some truly scary moments as well, and gives some of the best horror actors of all time — Vincent Price, Boris Karloff, and Peter Lorre — room to work, and they do so wonderfully. 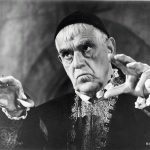 The raven, in fact, is the transformed Dr. Adolphus Bedlo (played excellently by Peter Lorre) — who has been changed into a bird due to his failure in a wizard’s duel with another wizard, Dr. Scarabus — who is played wonderfully by Boris Karloff, although the viewer doesn’t get to actually see Karloff on screen for the time being; first, Vincent Price has to try and return Peter Lorre to his human form. This requires a visit to Craven’s father’s tomb for some of the necessary “ingredients” — and a warning from beyond the grave from Craven’s long-deceased father. This segment is legitimately spooky, and not for the younger viewers — and part of why The Raven makes an excellent movie for Halloween. “My dear, there’s nothing to be afraid of …” when Boris Karloff says that, there’s plenty to be afraid of! And, Dr. Scarabus is hiding a secret from the Craven’s — which makes it difficult to explain any more without giving away secrets, other than to say the 2 “wizard duels” are hilarious and well worth watching. I recommend The Raven very highly. 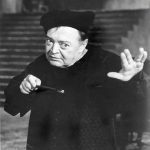 Peter Lorre as the wizard Dr. Bedlo, in a wizard’s duel with Boris Karloff! In this tongue-in-cheek movie inspired by Poe’s poem, Dr. Craven is the son of a great sorcerer (now dead) who was once himself quite skilled at that profession, but has since abandoned it. One evening, a cowardly fool of a magician named Bedlo comes to Craven for help- the evil Scarabus has turned him into a raven and he needs someone to change him back. 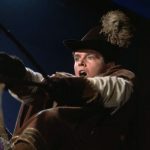 He also tells the reluctant wizard that Craven’s long-lost wife Lenore, whom he loved greatly and thought dead, is living with the despised Scarabus. 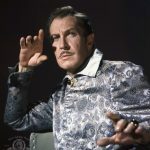 Dr. Craven (Vincent Price): [to the raven] Are you some dark winged messenger from beyond?, answer me monster tell me truly! shall I ever hold again the radiant maiden whom the angels call Lenore? 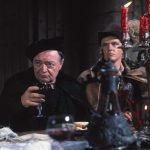 Dr. Bedlo (Peter Lorre): [as the raven] How the hell should I know?, what am I a fortune teller?, Ooh I’m chilled to the bones, why don’t you get me some wine”¦ well just don’t stand there gaping at me! Dr. Bedlo (Peter Lorre): [Interrupting him] Will you give me some wine? Dr. Bedlo (Peter Lorre): Milk?, how vomit-able! Dr. Bedlo (Peter Lorre): Hurry up will you! Dr. Bedlo (Peter Lorre): What do you expect me to do hold it? with what? … Oh never mind! Dr. Bedlo (Peter Lorre): Mmm I like that, mmmm! Dr. Craven (Vincent Price): [watching Dr. Bedlo as a raven drinking from the chalice] Why pardon my soul! Dr. Bedlo (Peter Lorre): Never mind your soul start concentrating on getting me back to my rightful form! Dr. Craven (Vincent Price): Your rightful form? Dr. Bedlo (Peter Lorre): Well what do you think I was born this way? 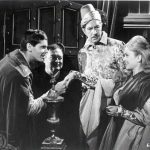 Dr. Craven (Vincent Price): Well I, I have it you are under an enchantment! Dr. Bedlo (Peter Lorre): Took you long enough to find that out! Dr. Bedlo (Peter Lorre): Lets get to work, well go ahead do something! Dr. Craven (Vincent Price): But what? Dr. Bedlo (Peter Lorre): Oh no, well do you got some dried blood of a bat in the house? Dr. Craven (Vincent Price): I beg your pardon? Dr. Bedlo (Peter Lorre): How about some chain links from a gallow’s burg?, jellied spiders, rabbit’s blood, dead man’s hair? Dr. Bedlo (Peter Lorre): And that calls himself a magician, honestly this is too much! Dr. Bedlo (Peter Lorre): Hard place to keep clean, huh? Dr. Craven (Vincent Price): Yes, I very seldom get down here. Dr. Craven (Vincent Price): Thank you. Dr. Bedlo (Peter Lorre): Ouuuu! Dr. Craven (Vincent Price): I’m sorry. Dr. Craven (Vincent Price): . Forgive me papa. Dr. Bedlo (Peter Lorre): What did he say? Dr. Craven (Vincent Price): He told me to, to beware. Dr. Bedlo (Peter Lorre): Of what? Dr. Craven (Vincent Price): I don’t know. Dr. Bedlo (Peter Lorre): I suggest we better leave here, huh? Dr. Bedlo (Peter Lorre): Don’t forget my hair! Come on, hurry up! Dr. Bedlo (Peter Lorre): A little unexpected what happened down there, huh? Dr. Craven (Vincent Price): Yes it was most unexpected. I, I just don’t understand why should my father return from the dead and then tell me to beware, of what? Dr. Bedlo (Peter Lorre): I wish I knew, I, I, I, I wish I knew. Dr. Bedlo (Peter Lorre): Uh, that milk! Dr. Craven (Vincent Price): Oh I am sorry. Dr. Bedlo (Peter Lorre): In any case I have to return to the castle of Dr. Scarabus tonight. Dr. Craven (Vincent Price): Oh no, sir please, I beg you, I implore you. Don’t go back there. Dr. Bedlo (Peter Lorre): But he has confiscated all my magical equipment and I want revenge. Dr. Craven (Vincent Price): But he is too powerful. Dr. Bedlo (Peter Lorre): Then come with me. Dr. Craven (Vincent Price): No. No I want nothing to do with him. Nothing at all. Dr. Craven (Vincent Price): You’ll need something to protect you from the cold. Dr. Craven (Vincent Price): No, I meant clothes! Dr. Bedlo (Peter Lorre): Oh. Rexford Bedlo: I am Dr. Bedlo’s son! Dr. Scarabus: Afraid my dear? There’s nothing to be afraid of. Dr. Scarabus: I’m always fascinated by your utter lack of scruples. Rexford Bedlo: I was afraid you would scream. Estelle Craven: Is anything wrong? Rexford Bedlo: Don’t be alarmed but I’m afraid Dr. Scarabus killed my father. Rexford Bedlo: Yes, during the dueling I observed Dr. Scarabus making fertive gestures with his fingers. Now we must speak to your father. Estelle Craven: But I already have. He trusts Dr. Scarabus. Rexford Bedlo: We’ll have to try. Estelle Craven: What’ll we do. Estelle Craven: What are you doing? Rexford Bedlo: This ledge leads to your father’s room. Estelle Craven: But you might be killed! Rexford Bedlo: I hope not! Lenore Craven: You sly old thing you. Lenore Craven: And what was his price? Dr. Bedlo (Peter Lorre): Who, mine? A double value. Superior magical knowledge and through my death by lightning, freedom from overbearing women. Lenore Craven: Well worth the cost of being turned into an insignificant bird. Dr. Scarabus: To say nothing of luring Dr. Craven to me, don’t forget that my love. Lenore Craven: I can’t imagine why you want him here. Dr. Scarabus: It’s not Craven I want, it’s his magic. Estelle Craven: [Estelle, Dr. Craven, Dr. Bedlo and Rexford are all bound to columns in the dungeon] Can’t you get your hands free father? Dr. Craven (Vincent Price): I’m afraid not my dear. What with Dr. Scarabus having turned me into a statue and then binding me like this. Dr. Bedlo (Peter Lorre): I know I”¦ I know I’m a disgrace. Rexford Bedlo: I had a somewhat stronger word in mind. Dr. Bedloe: But son, you know that, that everything I tried in life I was a failure. Only, only the day I joined the Brotherhood of Magicians. Oh I, I was the happiest man on earth. I still remember how happy I was. And then when, when Dr. Scarabus offered to teach me superior magical knowledge for luring Dr. Craven here, I just couldn’t resist that magnificent award. But Erasamus, believe me with all my heart I regret what I have done to you. Dr. Craven (Vincent Price): You are not alone in guilt sir. I too have failed at the task of living. Dr. Bedlo (Peter Lorre): Oh no. Dr. Craven (Vincent Price): Oh yes, yes. Instead of facing life I turned my back on it. I know now why my father resisted Dr. Scarabus. Because he knew that one cannot fight evil by hiding from it. Men like Scarabus thrive on the apathy of others. He thrived on mine and that offends me. By avoiding contact with the brotherhood I’ve given him freedom to commit his atrocities, unapposed. Dr. Bedlo (Peter Lorre): You sure have! Dr. Bedlo (Peter Lorre): [as the raven] Erasamus, now that Dr. Scarabus is out of the way we’ve got to make immediate plans for your assumption of the grand mastership. I’ll glady act as your liaison so, so you won’t be bothered having to present your case personally to the brotherhood. Later on I’ll be happy to assume the post of super numeri secretary dispencer. Dr. Craven (Vincent Price): Dr. Bedlo. Dr. Bedlo (Peter Lorre): [as the raven] Yes? Dr. Craven (Vincent Price): Do you really think such treachery can be so easily forgiven and forgotten? Dr. Bedlo (Peter Lorre): [as the raven] Treachery! I saved all your lives! Dr. Craven (Vincent Price): After having put them in jeopardy in the first place. Dr. Bedlo (Peter Lorre): [as the raven] That’s beside the point. Very well, if that’s the way you feel about it, kindly return me to my rightful form and I’ll leave. Dr. Craven (Vincent Price): Well, I’ll uh, I’ll take it under advisement. Dr. Bedlo (Peter Lorre): [as the raven] Take it under advisement? Well really! Who do you think you are talking to anyway? Dr. Craven (Vincent Price): Up. Dr. Bedlo (Peter Lorre): [as the raven] What’s that? Dr. Craven (Vincent Price): Up! 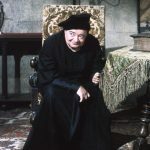 Dr. Bedlo (Peter Lorre): [as the raven] Now wait a minute Erasmus! Dr. Bedlo (Peter Lorre): Really! Dr. Bedlo (Peter Lorre): I never heard of such ingratitude in my entire life. It’s getting so you can’t trust anybody anymore. I’m just too sweet and gentle, that’s my problem! Dr. Bedlo (Peter Lorre): What is it? Dr. Craven (Vincent Price): Shut your beak! Quoth the raven, nevermore. Peter Lorre and Jack Nicholson were fond of ad-libbing their lines, much to the annoyance of Boris Karloff, who was working from the script. In casting his spells, Dr. Bedlo uses several Latin phrases: Veni vidi vici: I came, I saw, I conquered. De mortuis nil nisi bonum: Do not speak ill of the dead. Cave canem: Beware of the dog. Si vis pacem parabellum: If you want peace, prepare for war. Ceterum censio Carthaginem esse delendam: Furthermore, I believe that Carthage must be destroyed. The events in the film take place circa 1506 based on two clues offered early on. Dr. Craven states that his father has been dead 20 years, and when they show the plate on the coffin the date of death is given as 1486. Boris Karloff’s first feature film since Corridors of Blood, shot September-October 1962.